Partial derivatives in calculus are derivatives of multivariate functions taken with respect to only one variable in the function, treating other variables as though they were constants. Repeated derivatives of a function f(x,y) may be taken with respect to the same variable, yielding derivatives Fxx and Fxxx, or by taking the derivative with respect to a different variable, yielding derivatives Fxy, Fxyx, Fxyy, etc. Partial derivatives are typically independent of the order of differentiation, meaning Fxy = Fyx. Calculate the derivative of the function f(x,y) with respect to x by determining d/dx (f(x,y)), treating y as if it were a constant. Use the product rule and/or chain rule if necessary. For example, the first partial derivative Fx of the function f(x,y) = 3x^2*y - 2xy is 6xy - 2y. Calculate the derivative of the function with respect to y by determining d/dy (Fx), treating x as if it were a constant. In the above example, the partial derivative Fxy of 6xy - 2y is equal to 6x - 2. 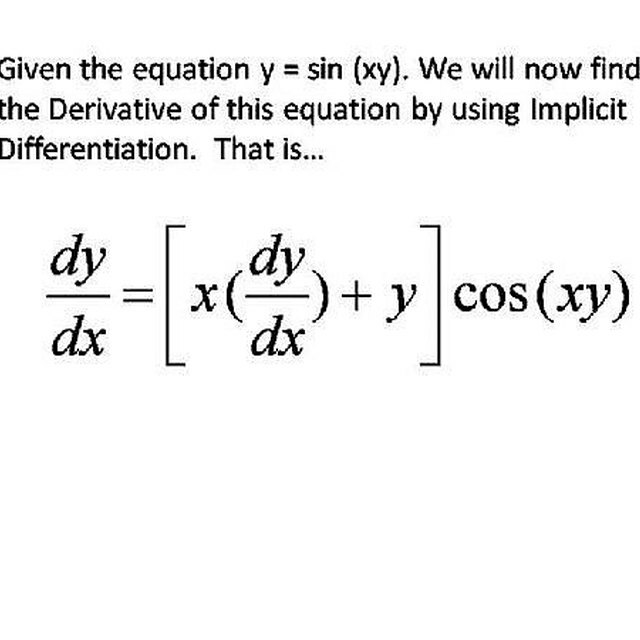 Verify that the partial derivative Fxy is correct by calculating its equivalent, Fyx, taking the derivatives in the opposite order (d/dy first, then d/dx). In the above example, the derivative d/dy of the function f(x,y) = 3x^2*y - 2xy is 3x^2 - 2x. The derivative d/dx of 3x^2 - 2x is 6x - 2, so the partial derivative Fyx is identical to the partial derivative Fxy. Wallulis, Karl. "How to Calculate FXY Partial Derivatives." Sciencing, https://sciencing.com/calculate-fxy-partial-derivatives-8502602.html. 24 April 2017.